Acorn™ stocks a wide variety of grouting products and provides coordination and field application assistance utilizing professional engineering experience to ensure proper use. Contact Acorn™ for a complete catalog on grouting products and applications. Grouting materials have been carefully developed to provide optimum performance, even in the toughest applications, along with unparalleled ease of preparation and placement. A highly flowable product which develops extremely high compressive strengths in a very short time. The product will not shrink, and is perfect for grouting precision machinery as well as anchor bolt setting and other machinery grouting applications. A flowable, fast setting product designed for setting anchor bolts and filling holes and large cracks in concrete floors, roads, sidewalks, etc. 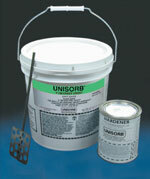 A self-bonding, quick setting, trowelable wall and ceiling patching compound. An ultra high strength fast setting non-shrink grout that is specifically formulated for the most demanding applications. 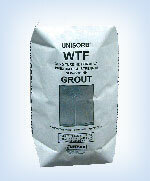 Ready to use plastic grout forms that eliminate on-site form construction. Easy to place and remove. 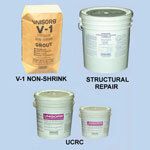 V-100® Epoxy Grouting materials offer solutions for specific machinery grouting needs. A superior quality product with excellent flowability, high resistance to impact, and extremely rapid cure times. 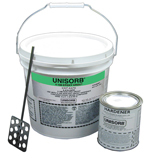 It is an excellent choice where very high strength and low grout quantities are preferred. 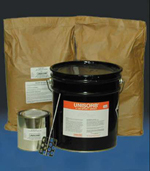 Reformulated version of Standard V-100 Epoxy Grout which may be shipped under non-hazardous classification, eliminating delays and haz-mat fees. Also complies with E/U non-hazardous shipping regulations. Develops super high compressive strengths in a very short period of time. Contributes to shorter construction times. 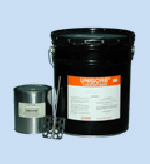 Espicially useful for the grouting of Wind Turbine Generator bases and other high performance applications. A highly flowable product intended for use where larger pours up to 8" deep are required, providing excellent compressive strength and rapid cure time. A product designed for rail installations which require extraordinarily high strengths combined with resistance to temperature, humidity, acid and chemical environments. This product will allow pours with 3/4" to 8" cross sections. A product designed for crane rail and other extraordinarily severe applications where ultra high strength combined with resistance to temperature and humidity are important. Reformulated version of CR Hi-Flow V-100 Epoxy Grout which may be shipped under non-hazardous classification, eliminating delays and haz-mat fees. Also complies with E/U non-hazardous shipping regulations. A product developed for sealing the exposed edge of inertia block isolation material at the floor level. It cures to a flexible solid state, preventing transmission of vibrations while protecting the edge of the isolation pad. A product developed to be used as a trowelable adhesive to place under steel plate, bonding them to concrete floors. This can be used in either temporary or permanent installations. This product bonds to most surfaces. 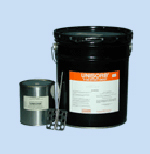 A product designed for applications where high mechanical strength and high temperature resistance over regular epoxy grout is required. It has a maximum service temperature of 325° F.
A product developed for applications where high mechanical strength and very high temperature resistance are required. It has a maximum service temperature of 425° F.
A product developed for applications where high mechanical strength is required, and where low temperatures are encountered while mixing and pouring. It performs best at temperatures between 45°-65° F.